JFrame is a class of javax.swing package extended by java.awt.frame, it adds support for JFC/SWING component architecture. It is the top level window, with border and a title bar. JFrame class has many methods which can be used to customize it. JFrame class has many constructors used to create a JFrame. Following is the description. 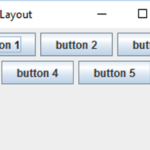 JFrame(GraphicsConfiguration gc): creates a frame with a blank title and graphics configuration of screen device. JFrame(String title): creates a JFrame with a title. JFrame(String title, GraphicsConfiguration gc): creates a JFrame with specific Graphics configuration and specified title. Here is a simplest example just to create a JFrame. To set title of a JFrame, you can use JFrame.setTitle(String title). 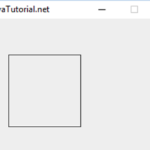 JFrame.setResizable(false), now it will appear according to the dimensions you have given in code and will not resize by the graphical interface. To change position of JFrame on screen JFranme provides a method JFrame.setlocation(int x, int), it takes two paramters x represents position along x-axis and y represents position along y-axis. The top left corner of your screen is (0,0). You can easily close your JFrame by clicking on the X(cross) at the top left corner of JFrame. 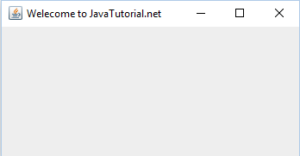 However JFrame.setDefaultCloseOperation(int) is a method provided by JFrmae class, you can set the operation that will happen when user clicks on cross. If “0” is given as a parameter, JFrame will not close even after clicking on cross. The best practice is to use JFrame.EXIT_ON_CLOSE, it exits application (JFrame) and releases memory. JFrame.HIDE_ON_CLOSE: It doesnot close JFrame, simply hides it. JFrame.DISPOSE_ON_CLOSE: It dispose the frame off, but it keeps running and consumes memory. JFrame.DO_NOTHING_ON_CLOSE: It does nothing when user clicks on close. Java Core basics, close, create, java, JFrame, set position, set size, set title, set visible, Swing. permalink.